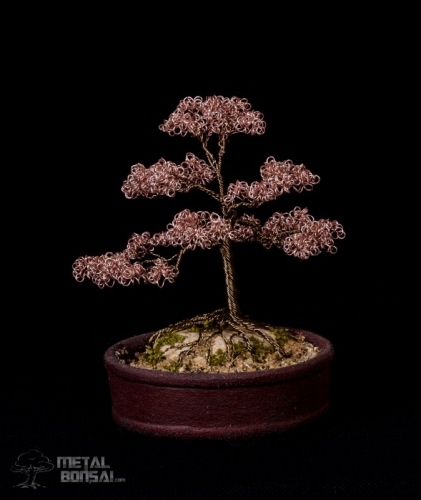 This sakura (cherry blossom) wire tree sculpture incorporates a couple of styles all at one. The formal Chokkan style of the trunk along with the Sekijo of the roots over the rock. Made using 2 coloured wired, the gunmetal brown of the trunk and branches are twisted together with rose gold which makes up the foliage/ flowers. The roots run over the rock and into the ground around it securing the tree. The pot is a dark red circular container and is finished with amazonian sand and moss effect. This tree turned out amazing and I am very happy with it.